Jim Fox was born in Cleveland Ohio August 24, 1947. Jim attended Ohio State University, Cleveland Institute of Music and Kent State University majoring in music. He discovered rock and roll when the Beatles arrived on the scene and left a career in classical music to play rock. He formed the band The James Gang in 1966 and led the band to numerous albums, two movies and appearances all over the world. Drums are his main instrument but in his own words he plays "badly" at several others. Contrary to what most collectors do, Jim didn't specialize. He collected everything! By the early 1990's he had one of the best North American and World collections ever assembled. For years no one even came close to matching it in quality, quantity and rarity. He had virtually complete runs for all 50 states, thousands of porcelains and pre states, as well as runs (not merely singles) from almost every country which has ever existed. Quite a few of his plates were literally unique -- that is, they were the only examples known to exist. Jim devoted himself for over 25 years to our organization. Jim served as President of ALPCA from 1983 through 1985 and again from 1993 through 1995. He was a member of the Board of Directors from 1976 through 1982 and again for 1985-1986. He co-hosted ALPCA's 25th international convention in Mentor, Ohio, in 1979, which at the time was the largest in ALPCA's history. 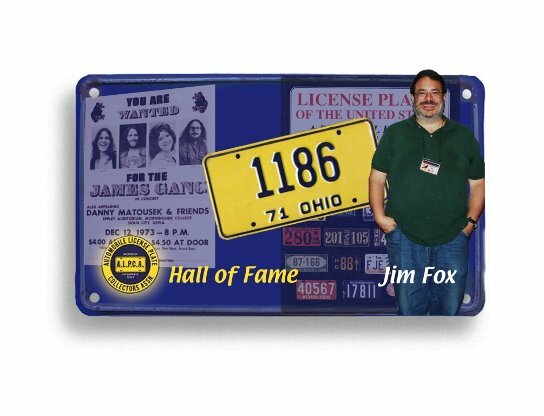 Jim also researched and wrote extensively about license plates, both American and foreign. He authored a number of articles in the ALPCA Newsletter, the forerunner of Plates magazine and was a frequent contributor to Car Collector magazine. In 1994, he wrote License Plates of the United States. Now in its third edition, this book, which features color photographs of complete runs for all 50 states, also includes informative text on each state, color codes and a brief history of ALPCA by Keith Marvin. It is truly the bible for anyone seriously interested in collecting North American license plates. Despite the fact that Jim's collection was beyond the wildest dreams of the rest of us, Jim always had the time to help other collectors, even the greenest novice. In 2000, Jim began disposing of his collection -- to the delight of many collectors, who now had a chance to acquire some of his outstanding rarities. Although Jim is no longer as active in club affairs as he once was he is still an active collector interested in research and selling. He still attends regional and national meets as his schedule permits. Those who attended Erie in 2009 were reintroduced to Jim's knowledge and friendly demeanor. His band also started limited touring in 2006 to the delight of his many fans and we look forward to more appearances. It is an extreme privilege to welcome Jim Fox to the ALPCA Hall of Fame.